Powers/Abilities: Proctor has many powers and abilities including superhuman strength (class 10), speed, stamina, durability, agility, and reflexes. His other abilities include teleportation, limited mental powers including mentally enthralling his Gatherers, telekinesis, the ability to shoot powerful energy beams from his hands and eyes, the ability to heal, He can manipulate the chemical structure of the human brain, causing pain, etc. ; access to a great deal of advanced technology; and the ability to perform a "gathering." He also used the Ebony Blade, an unbreakable sword that could cut through just about anything. He is a formidable hand to hand combatant and he wears a light, protective body armor. History: (Avengers I#374 (fb)) - Proctor, an alternate version of the Black Knight, was the leader of another dimension's Avengers. Proctor fell madly in love with Sersi, who made him her Gann Josin (the name for the life mate of an Eternal). But eventually the Sersi grew bored with Proctor and left him, driving him mad. (Avengers I#375 (fb)) - Proctor also fell victim to the blood curse of his version of the Ebony Blade. However, instead of resisting the curse like the Black Knight of Earth-616, Proctor embraced it. Through the curse and his Gann Josin status, Proctor gained incredible powers. (Avengers I#363 (fb)) - The Sersi of Proctor's Earth was apparently driven insane by him through their Gann Josin link and destroyed the Earth of that dimension. Proctor alone survived, and killed his Sersi with the Ebony Blade. Somehow traveling to another dimension following his own dimension's destruction, Proctor repeated the process by which he killed his own Sersi and drove this Sersi mad as well, and then killed her. He then found the last survivor of this reality: Ute the Watcher. Ute lay near death as the world was in its death throes, and Proctor took Ute and used his power to seek out other dimensions. He then embarked on a quest that would dominate him for the rest of his life: To kill every single version of Sersi in every dimension, concluding with killing the Sersi of Earth-616 and collapsing all reality as well (see comments). To do this, he began seeking agents called the Gatherers, locating their dimensions via the power of Ute the Watcher. He recruited each last surviving member of the Avengers of a world which Sersi destroyed (possibly pushed to madness by Proctor himself) to be a Gatherer, and had a certain amount of mental influence and control over those Gatherers. (Avengers I#355 (fb) - BTS) - Sometimes, in order for a Gatherer to survive indefinitely in the Earth-616 dimension, Proctor would need to kill their Earth-616 counterpart so that the Gatherer could get in sync with the reality. He called this process a "gathering." (Avengers I#355 (fb)) - At some point, Proctor recruited Cassandra, Tabula, Sloth, and Magdalene, probably in that order. He also built a citadel as his base in the Andes mountains of Earth-616. (Avengers I#358 (fb) - BTS) - At some point, Proctor came to share a telepathic rapport with Cassandra. (Avengers I#359 (fb)) - After serving Proctor well on many missions, Proctor put Tabula in stasis due to Tabula's "curiosity" for an undetermined, but apparently very long, time. (Avengers I#348 (fb) - BTS) - Magdalene began to have stronger feelings for Proctor, and the two became lovers for a time. However, when Proctor rescued an extra-dimensional version of the Swordsman and recruited him as a Gatherer, Magdalene began to fall in love with the Swordsman; a humiliating moment for the possessive Proctor. Despite the uncomfortable situation, Proctor kept Magdalene and the Swordsman as Gatherers. (Avengers I#373 (fb)) - Over time, Proctor killed hundreds of versions of Sersi in hundreds of dimensions by driving them insane with his Gann Josin mind link, causing them to nearly destroy Earth, and killing them with the Ebony Blade. He kept all their bodies in a trophy room. (Avengers I#343-344 - BTS) - Proctor apparently sent Magdalene and Swordsman to battle the Avengers of Earth-616. After the two needed to retreat due to the Swordsman's headaches, Magdalene begged Proctor to heal Swordsman. Proctor did so, and reminded Magdalene that she once felt for him what she did for the Swordsman. (Avengers I#348) - Proctor and Magdalene went to the apartment of Melissa Darrow, Magdalene's Earth-616 counterpart, and Proctor, "gathered" her so that Magdalene could live. (Avengers I#355 (fb) - BTS) - Proctor sent the Gatherers, cloaked from detection, to infiltrate the Avengers base at least twice. Once they infiltrated the Avengers' security beacon, and once they sabotaged the Black Panther's skycar. (Avengers I#355) - Proctor sent the Gatherers to yet another alternate Earth where he had driven Sersi mad to recruit a Gatherer. This Gatherer was to be an alternate version of the Black Panther called the Coal Tiger. However, the Coal Tiger was damaged by the transition between dimensions, and after examining the unconscious Coal Tiger, Proctor determined that for him to survive, his counterpart would need to be "gathered." Proctor sent the Gatherers to invade Avengers' Mansion one more time to get the information of the location of the Coal Tiger's counterpart from the Avengers' computers. (Avengers I#357 - BTS) - Proctor killed a man with whom Sersi had been partying with, planting some unstable molecules near his body as false evidence that a superhero had committed the crime. Proctor had apparently done this several times. (Avengers I#358) - After the Swordsman had been taken prisoner by the Avengers during a battle between the Avengers and the Gatherers, Magdalene begged Proctor to let them rescue the Swordsman. Proctor was still quite bitter at the Swordsman for stealing Magdalene from him, and also, the Swordsman was now a danger to Proctor. Proctor told Magdalene, Sloth, and Cassandra that he was going to send them on another mission to recruit a new Gatherer that would rescue the Swordsman. However, he was actually sending them on a mission to recruit a Gatherer through whom Proctor was planning on killing the Swordsman. (Avengers I#359) - Proctor released Tabula from stasis in order to assist with his plan to assassinate the Swordsman. He welcomed the Gatherers back from their mission on which they had successfully captured an alternate version of the Vision. (Avengers I#360 (fb)) - Proctor had the Gatherers ambush the Vision of Earth-616, capture him, and bring him back to the Citadel. (Avengers I#360) - Using very advanced technology, Proctor switched the minds of the Gatherer's Vision and the Vision of Earth-616, and sent the Gatherer's Vision to infiltrate the Avengers for them from within. He then imprisoned the Vision of Earth-616, fitting him with a chip that inhibited his density powers. (Avengers I#360 - BTS) - Proctor used his Gann Josin link to begin to cause Sersi to start having violent uncontrollable rages in which she indiscriminately struck out at everyone around her. (Avengers I#361) - The Vision of Earth-616 attempted to escape his imprisonment, but Proctor intercepted him and defeated him with ease. (Avengers I#363 - BTS) - Proctor killed two cops who had been questioning Sersi about the recent murders where they had found unstable molecules at the site. He turned them into stone and threw them into a river. (Avengers I#363) - The Avengers were led to Proctor's citadel by the false Vision, whom they had discovered in their midst. They attacked the citadel and were gaining the upper hand against the Gatherers when Proctor showed up. Proctor proclaimed to the Avengers that the games were now over and that they would pay the price. Proctor then nearly killed the Gatherer's Vision for leading the Avengers to the Citadel. Proctor appeared to be surprised and upset to realize that Sersi of Earth-616 had established a Gann Josin link with the Black Knight. Proctor told the Avengers that he was a Gann Josin as well, though he neglected to mention it was to an alternate dimensional Sersi. Proctor told the Avengers of Sersi's coming madness and that she would destroy their world. Black Knight attacked Proctor, but Proctor dispatched the Black Knight with a wave of his hand and then showed the Avengers Ute, and repeated that Sersi would inevitably go mad. Magdalene realized that Proctor had tried to kill the Swordsman and attacked Proctor, who paid her little attention. Proctor activated the self destruct sequence of his citadel, not wanting to settle his game with the Avengers just yet, as he had more plans for them. The Black Knight thrust his energy sword into Proctor's chest. Proctor teleported away, promising that it was all far from over. (Avengers I#372 (fb) - BTS) - Proctor recruited a new team of Gatherers, including Rik, Tarkas, Sliver, Korg, and an alternate Jocasta. (Avengers I#372) - Proctor, disguised as a man with precognition, led the police to find the bodies of the two detectives whom Proctor had murdered and changed into stone. He told the police that he had visions of a woman of vast power living in a mansion of heroes that did this. The police collected all the false evidence that Proctor had planted framing Sersi for these murders, and headed to Avenger's Mansion to arrest Sersi. Proctor's new team of Gatherers attacked Sersi and the Black Knight without Proctor's permission. The battle was not going in their favor when Proctor teleported them all back to a small townhouse in Greenwich Village and condemned them for acting without his permission. He told them that Sersi had to suffer before she would be allowed to die. He warned his Gatherers never to act on their own again. (Avengers I#373) - As Jocasta demanded to know why Proctor stopped the Gatherers attack on the Avengers, Proctor told her she needed to learn patience, and promised that within the day, the group would make their final move. He then taunted the captured Watcher, Ute, before finally making his presence known to a crazed Sersi. (Avengers I#374 - BTS) - Proctor captured Sersi and brought her to his secret lair. (Avengers I#374) - Explaining that the captured Sersi's brainwaves were nearly identical to her Gann Josin, Proctor admitted that he was behind her recent headaches and violent mood swings. Sersi escaped, but when she stumbled upon Proctor's trophy room, where he held Ute and the bodies of hundreds of alternate Sersis whom he had killed, her shock led her to be captured once more by the Gatherers. (Avengers I#375) - Proctor and the Gatherers appeared in the middle of New York City, with Ute and Sersi held captive in an energy field. Proctor was drawing power off of Sersi and Ute and using them in an effort to collapse all reality. Proctor was attacked by Hercules, but was not seriously harmed by Hercules' punch, and simply began to collapse realities further by drawing off of the energy field. Proctor's Gatherers fought against the Avengers in a colossal and relatively evenly matched battle, with the Black Knight taking on Proctor. Proctor revealed that he kept the Ebony Blade, and used it in a sword fight against the Black Knight. Proctor expressed his belief that it was all Sersi's fault that he was doing this, and that she is the one who drove him mad, and also expressed his hatred of the Black Knight for having the love that Sersi would never give Proctor and turning it down. Proctor quickly had the Black Knight at his mercy and began to "gather" the Black Knight, causing the Knight great pain in the process. However, Quicksilver interrupted the Gathering. Proctor prepared to kill Quicksilver with an energy blast, but before he could, he was hit by a lightning bolt summoned by Thunderstrike. When Proctor got hit by the lightning, his Gatherers all collapsed, as he mentally controlled all of them to a certain extent and the feedback from the lightning hitting Proctor knocked them out. With Proctor weakened by the lightning, Sersi broke out of the energy field, picked up Proctor's Ebony Blade, and killed him with it. Comments: Created by Bob Harras, Steve Epting, and Tom Palmer. If Proctor was going to conclude the extermination of all counterparts of Sersi with the version on Earth-616, that would mean that there should not be a Sersi in any other reality. I REALLY doubt that is the case (we may have seen a Sersi in an alternate worlds story, but I don't recall). More likely, Proctor just had no idea of the scope of his mission, and killed hundreds of them, figuring that that was all there were. 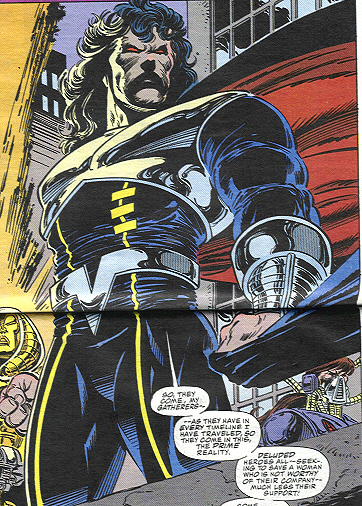 An alternate world Sersi appeared in the "What if the Avengers Lost Galactic Storm" storyline (from What If II#55 + 56 (November, December, 1993). A Proctor is a supervisor, especially of an examination or dormitory in a school. Proctor definitely fits the supervisor part, as he observed and oversaw his schemes and his Gatherers from afar. According to Zerostar, Proctor's original Avengers group included Black Widow, Captain America, Crystal, Iron Man, and Sersi. 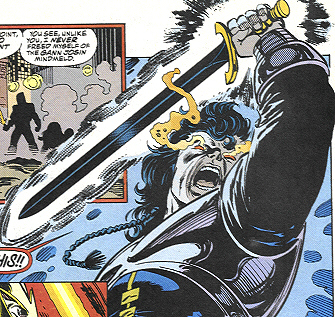 However, he also claimed in issue #275 that he had no Crystal to divert his love away from Sersi. On the other hand, he may have meant that there was a Crystal on his team, but he didn't fall in love with her. It seems like he used his abilities as Sersi's Gann Josin to drive the alternate Sersis mad, which caused them to destroy their worlds. I had assumed that Proctor was the Hate Monger/Animus upon first seeing him. Not that much variation between the two from the neck up. Thanks to Katu Watcher for pointing out a few mistakes in the power section and under enemies.